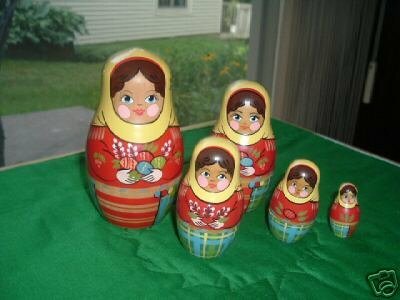 There are 6 dolls, each nesting inside the other (smallest doll not pictured in photo). Featuring Brest maidens with Easter eggs, the maidens have brown hair and big pink cheeks. The largest doll is 4½” tall. Very cute and very colorful in vibrant red, yellow, blue and green.